Interested in learning more about alcohol detox? The first step on the road to recovery from alcoholism/alcohol addiction is admitting that you have a problem. Once you are at this stage, you are open to the idea of rehabilitation, but before that it may be necessary for you to complete a programme of detoxification. Most people suffering from alcoholism/alcohol misuse will need to detox. To suddenly stop drinking however, can be quite dangerous and it is not uncommon to experience alcohol withdrawal syndrome particularly if an individual has been drinking heavily for some time. The process of alcohol detox involves getting rid of alcohol from the body; during this process, it is common for individuals to suffer from alcohol withdrawal symptoms, all varying in severity. These symptoms can include mild sweating, shaking, mood swings, nausea, vomiting, diarrhoea, and hallucinations. Alcohol is a depressant and ‘slows down’ or numbs the mind and body. The first time a person drinks alcohol, the body will try to resist the effects by accelerating certain functions. As the effects of alcohol wear off, the body again tries to counteract this in order to get back to normal. This can result in the individual feeling uncomfortable and may result in him or her drinking again to take the edge off. This new dose will provide temporary relief (alcohol dependency), but the body will again try to resist the effects. Those who continue to abuse/misuse alcohol will experience a cycle of highs and lows and, as their body begins to get used to the increasing dependence on effects of alcohol, it will become necessary to drink larger quantities, or more often, to experience the desired effects. This is known as alcohol tolerance. In general, once the body becomes tolerant to the effects of alcohol, it will not be long before it begins to crave it and the affected individual will feel compelled to drink, even if doing so causes negative consequences. Alcoholism. 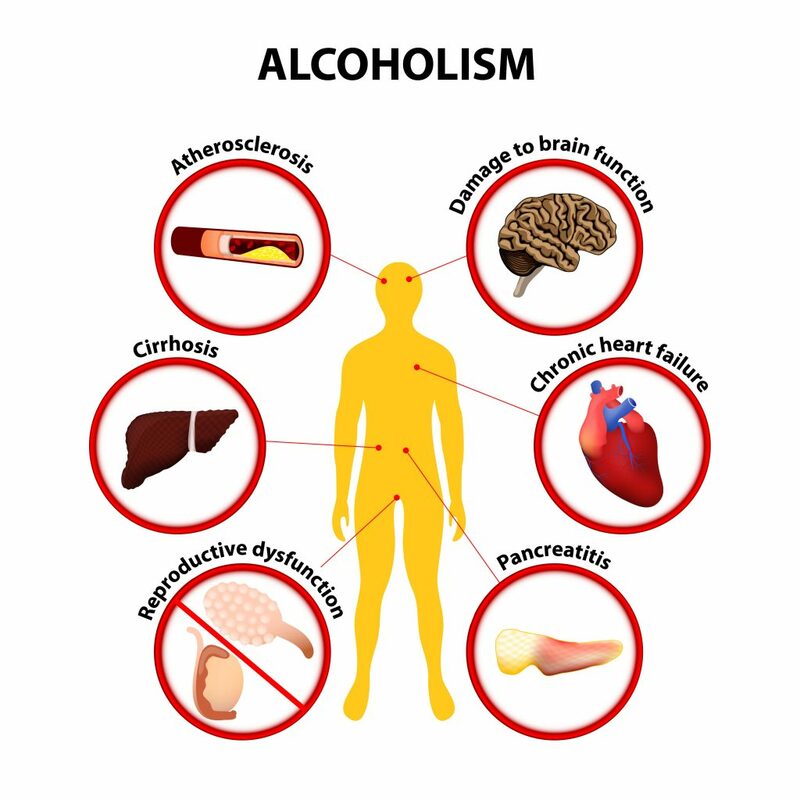 Some of the possible long-term effects of alcohol an individual may develop: atherosclerosis, cirrhosis, pancreatitis, damage to brain function, chronic heart failure, reproductive dysfunction. Overtime prolonged and excessive alcohol abuse can lead to a variety of medical complications including liver damage, respiratory failure, memory loss and various classifications of alcoholic dementia. Common symptoms observed during the last stages of severe chronic alcoholism; involves loss of memory for recent events and such as alcohol amnestic disorder, Korsakoff’s psychosis, Korsakoff’s syndrome, Korsakov’s psychosis, Korsakov’s syndrome and polyneuritic psychosis. When a person with alcoholism/alcohol dependency decides to get help, he or she will usually be advised to complete an alcohol detox programme, which will eliminate alcohol from the body. Nevertheless, once the supply of alcohol is suddenly cut off, the body will react by trying to get back to its normal baseline. Initially, it will be expecting the usual dosage and will continue to overcompensate in the meantime because of this effect, some rehab centres use a phased alcohol detox timeline. The effect of this is a variety of alcohol withdrawal symptoms and side effects, which can range from mild to severe. The aim of alcohol detox is to get rid of ethanol from the body completely so that the mind and body can begin to heal. Nonetheless, those who are going through the process will usually feel miserable as they try to manage the unpleasant alcohol withdrawal symptoms. In general, those who are detoxing from alcohol will begin to notice withdrawal symptoms / side effects between six and twelve hours after their last drink. At this stage, there may still be alcohol in their system, but as the body begins to realise that a new dose is not forthcoming, it will react, which can lead to symptoms such as anxiety, mood swings, sweating, restlessness, shaking, and insomnia. During alcohol detox, the mind and body overcompensate as they come to terms with the fact that no more alcohol is being consumed, and one of the earliest signs tends to be tremors or shaking. Some individuals will experience very mild shaking, which some describe as a fluttering while others will experience severe shaking that affects their ability to function. Most of the early symptoms of alcohol widthdrawal will subside within a few days, although some, such as trouble sleeping, can last for a number of weeks. Hallucinations affect around a quarter of those detoxing from alcohol abuse, and these usually occur around one to two days after the last drink. Many individuals who get hallucinations will first experience what appears to be fleeting shadows. This can progress to seeing things that are not there. Some people will hear or smell things that others cannot. Hallucinations can be quite vivid and intense and can cause those affected to become fearful and paranoid. Although they are not life-threatening, they can be terrifying and can cause some individuals to harm themselves or others. Many alcoholics never get the help they need because they are terrified of the DTs (delirium tremens). These are severe alcohol withdrawal symptoms that occur in a minority of cases, and they can be fatal if not treated correctly. DTs can occur around two to three days after the last drink, but some people experience them well into their second week of detox. DTs cause severe hallucinations that can result in intense sweating, shaking, and paranoia. Patients often lose all sense of reality and may become violent. Severe DTs can lead to shock, dehydration, high blood pressure, and heart irregularities. In extreme cases, they can cause convulsions and death. The DTs are considered a medical emergency and those affected require immediate hospitalisation. Alcohol detoxification normally takes anywhere from 3-14 days. How quickly an individual completes detox relies on a number of different factors that can include the severity of the alcohol problem, the individual’s overall health, the presence of any additional issues (like mental illness), and the person’s commitment to overcoming alcohol addiction. Seven days is about average for most people. As stated earlier, alcohol withdrawal symptoms usually begin to occur within 6-12 hours of the last drink. If alcohol intake is reduced gradually, the onset of withdrawal symptoms will be gradual as well. Symptoms tend to peak on the second or third day, before beginning to subside. The average alcoholic is symptom-free in about 10-14 days, though cravings and sleeping problems can persist for some time after. Alcohol abuse and dependence are serious issues requiring professional help. If you or someone you care about is in need of alcohol detox, please seek help right away by locating a residential clinic specialising in detox and rehab and securing immediate admission. Where to Find Alcohol Detox? Alcohol detox can be conducted on an outpatient or inpatient basis. Most of the time it is handled as an inpatient procedure at a residential treatment centre staffed by doctors, nurses and therapists who have the skills and resources to ensure a safe and effective treatment. Outpatient detox is offered through the NHS and some private clinics. The best choice of treatment facilities is dictated by the patient’s age, history of substance abuse, coexisting medical conditions, and underlying mental or psychosocial issues. It is important that you find the right detox program and facility for your needs. It is advised that anyone suffering from alcohol addiction undergo a programme of supervised detox. Detoxing in a medically-supervised facility means being safe and comfortable at all times. While not everyone detoxing from alcohol addiction will experience severe withdrawal symptoms, it is impossible to predict who will and who will not. For that reason, it is far safer to do so under the supervision of medical professionals. If you or a loved one requires information on detox programmes, please contact They can provide you with help and support as well as information on where you can access alcohol detox programmes suited to your needs and your budget. You must be made aware that any medication used will not make you stop drinking; only you can do that. Your determination to get well, despite any cravings for alcohol you may still have, is the most important factor in the entire equation. For the sake of yourself and your loved ones, we urge you to make the commitment to get well today.